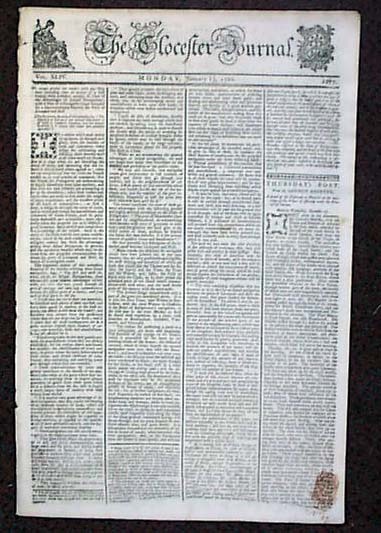 Item # 649299 THE GLOCESTER JOURNAL, England, 1766 (currently spelled Gloucester). Here is a very nice, four page issue from the year the Stamp Act was repealed and just a few years before the outbreak of the Revolutionary War in the colonies. This issue has a very nice & decorative masthead featuring engravings on either side. The front page also has a red-inked tax stamp. This issue contains various news of the day and a wealth of ads as well. The photo is generic but the actual issue you receive will look almost identical and be from the same year of 1766.